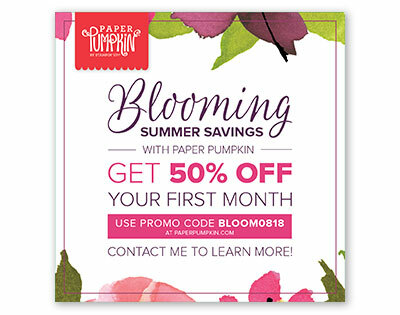 Karina's Kreations: Get 50% off New Paper Pumpkin Subscriptions! Get 50% off New Paper Pumpkin Subscriptions! Do you need a craft activity for your kids this summer? Stampin'Up has the perfect solution for you and it's 50% off until Aug 10. The kit is called Paper pumpkin and costs $27.95. The kit includes all the supplies to make the projects along with instructions and a video too. Enter the discount code BLOOM0818 at by August 10. I'm on the Stampin'Up Alaskan cruise today. I earned this cruise by building my team, running card classes and hanging put with my stamping friends. The starter kit is on special right now. You will receive 10 free ink pads as a special bonus. If you're interested here's the link join now! You could preorder the Blended Seasons bundle and new water color pencils with your kit. Here's a card I made with the stamp set and watercolor pencils.